The Horsepasture River in southwest NC runs but a short distance at a little over 18 miles long, before in emptys into Lake Jocasse in northern South Carolina. 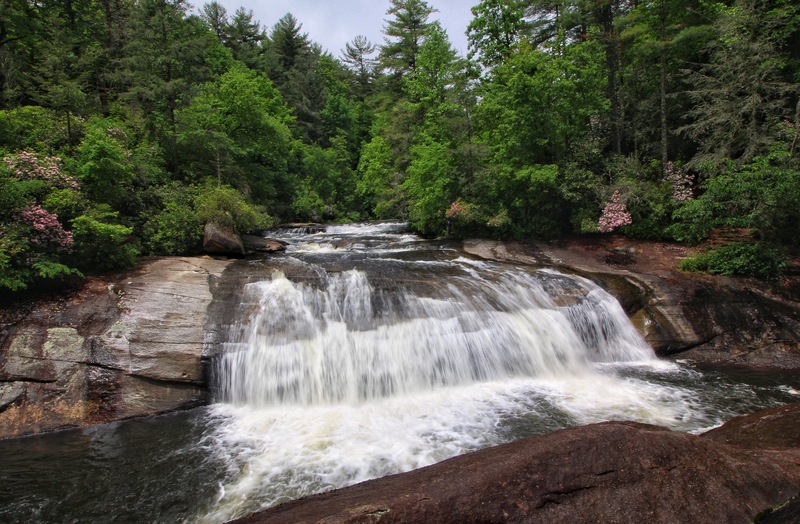 Even shorter is the 4.5 mile section from NC 281 to Lake Jocasse that is designated a wild and scenic river. 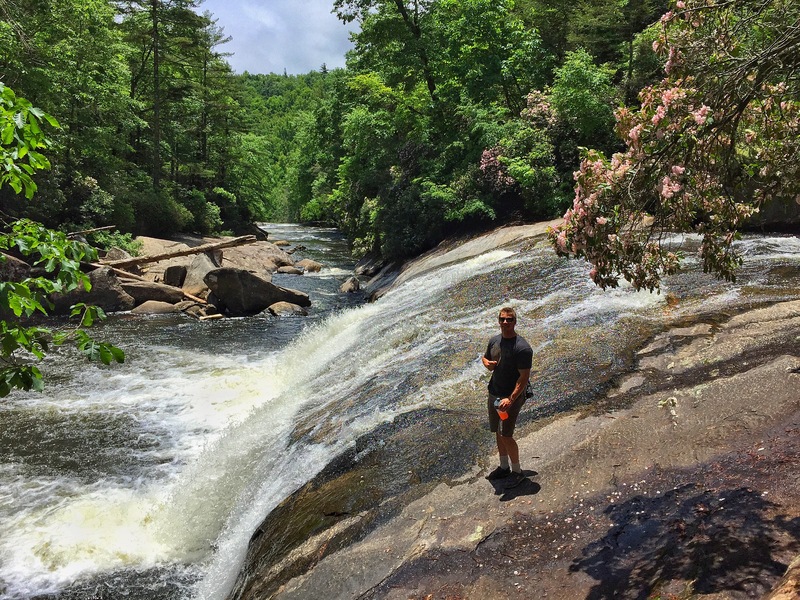 In this stretch of river is 6 named & famed waterfalls, tons of smaller falls and rapids that would might get names on most streams, and some of the prettiest waterfall scenery that North Carolina has to offer. This area receives a ton of rainfall. 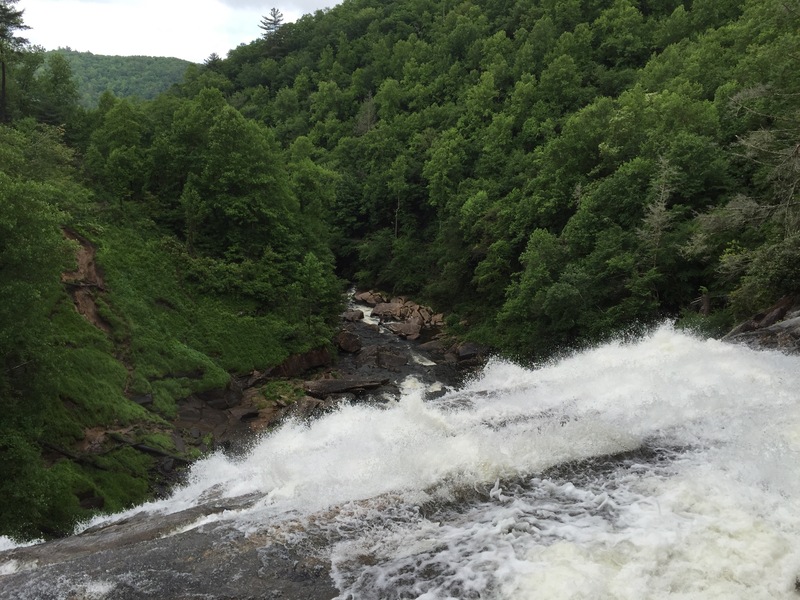 Gorges State Park, where the Rainbow Falls Trailhead is located, receives over 80 inches of rain per year. That’s a lot of water running down the hills, and the Horsepasture usually has a very healthy flow of water. 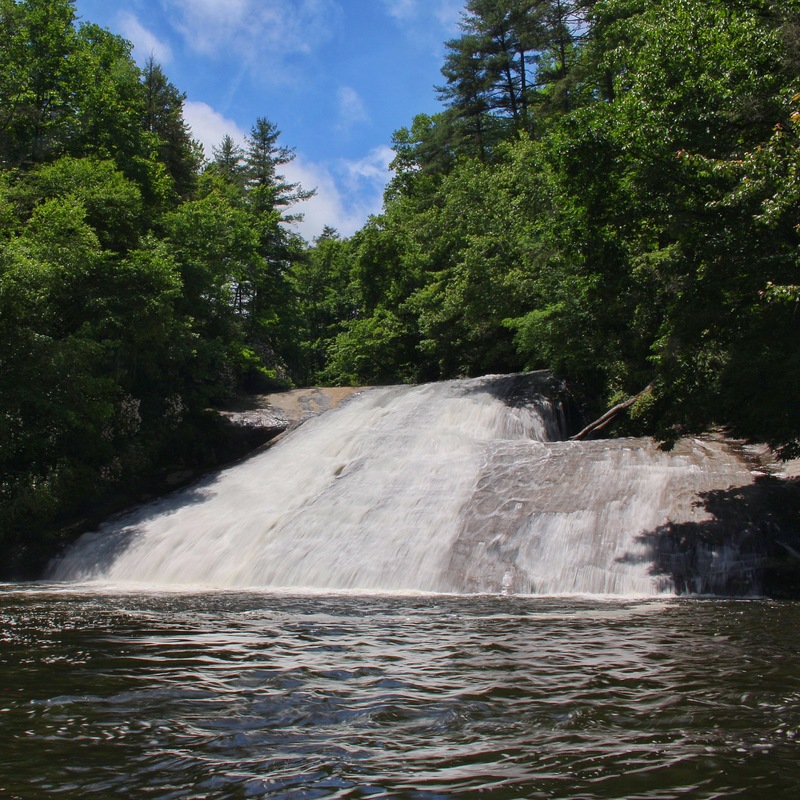 Of the 6 names falls, 4 of them are fairly safe to reach, Stairway Falls, Rainbow Falls, Turtleback Falls, and Drift Falls (viewable from the edge of pool only due to private property). I’ve done the hike on the Horspasture River probably 10 times or so over the past few years. It is easily one of my favorite waterfall hikes around. There is so much waterfall reward for the hiking efforts. This trip today was not special because of the Horsepasture though, it was the first waterfall hike with my younger brother Jerry. Jerry is 38 years old and has spent the last 20 years or so of his life dedicated to body building, and competitions. The constant dedication to the sport, running his own gym, and working a grueling long schedule as a UPS driver, has left little time over the years for us to do much together. 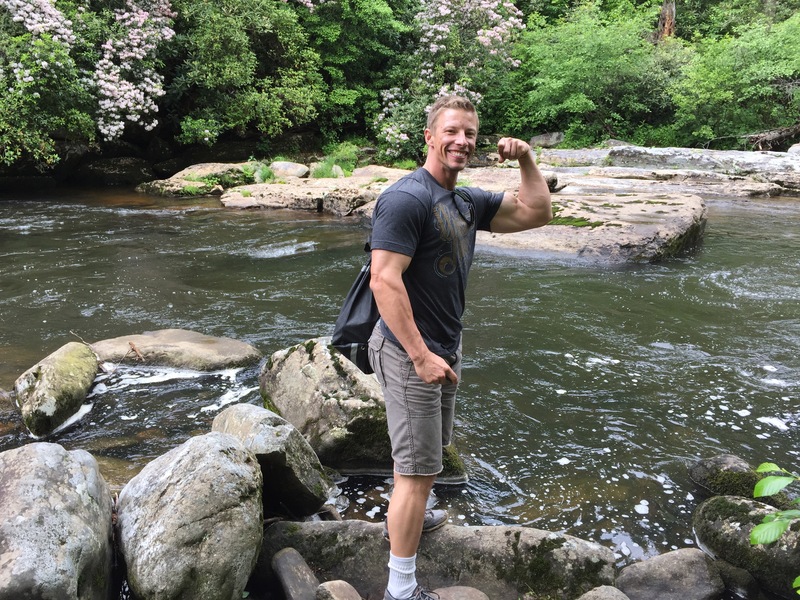 We were reminiscing some on this hike, and the last time we did anything close to this was a 2 day canoeing trip down the New River in West Jefferson, NC…some 19 years ago. It’s clearly been way too long. So when he gave me a call, to tell me he had the entire Memorial Day week off and wanted to go see some waterfalls, I was all over it and told him to name a day. I would get off work and make it happen. 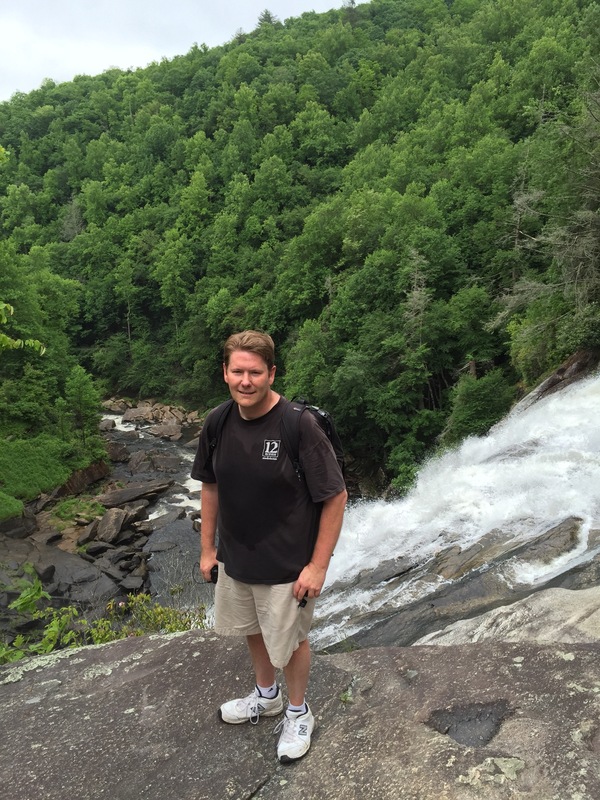 After a few weeks to decide where to go, I picked the waterfalls of the Horsepasture River. If he didn’t like these, there would be no need to take him anywhere else…lol. 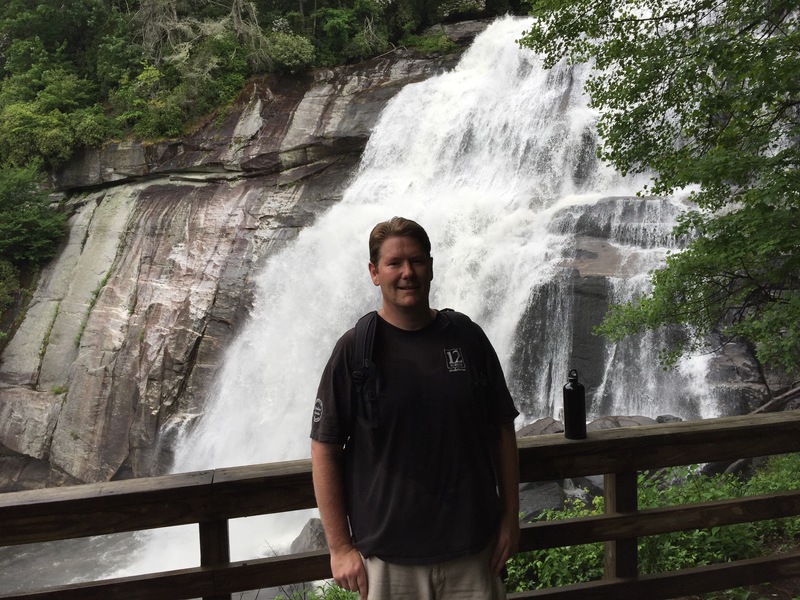 Coming from the Triad in west/central NC, I planned a short stop in Brevard, NC to show him Looking Glass Falls. 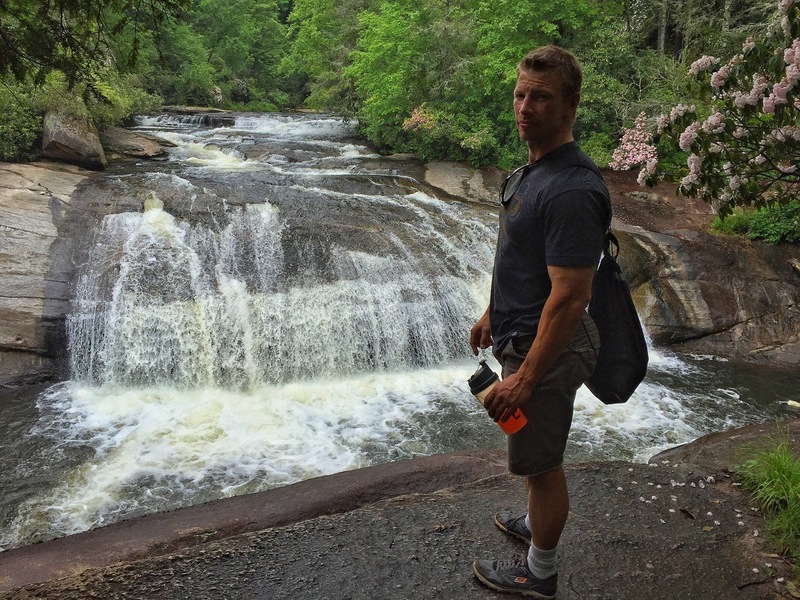 That’s a beautiful waterfall, and a great place to begin Jerry’s Waterfall List. 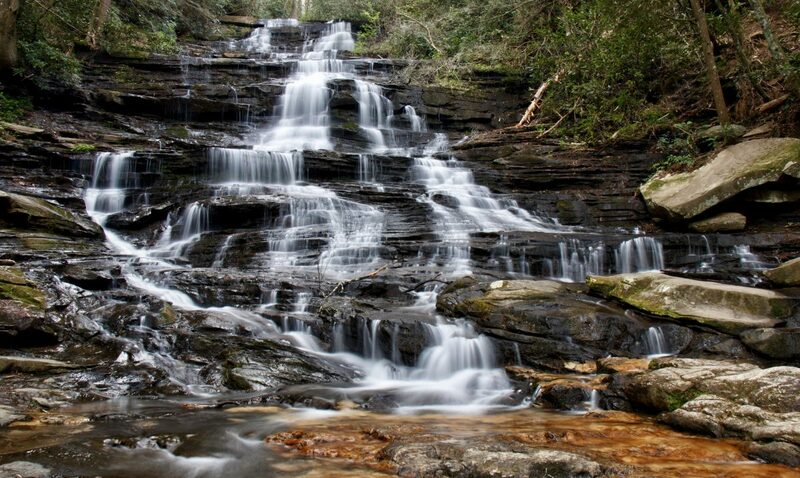 Jerry liked Looking Glass Falls , this was going to be a good day! Looking Glass was exceptionally beautiful today. The lighting conditions were still good down in the stream bed, just as the sun was filling in from above. There were only 2 other cars here. I explained how lucky we were to have this place somewhat to ourselves and that this place could fill up with over 100 people at any time. Our stay here was short as I was eager to get to Gorges State Park. 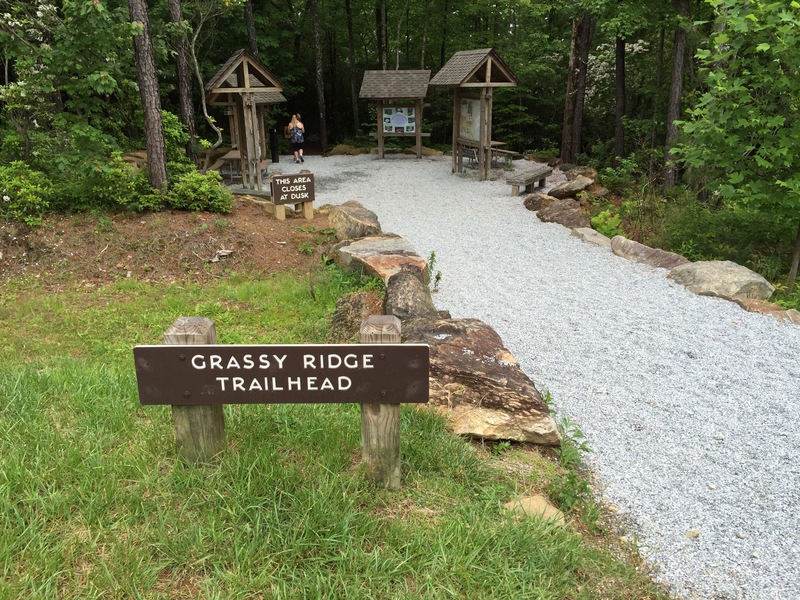 Back at Gorges now, our hike began at the Grassy Ridge Trailhead. After several hours on the road, we were ready to get out stretch our legs some. I was curios what his reactions to these waterfalls would be today. It had rained quite a bit the night before. The Laurel were in full bloom, and the green of May had filled in everywhere. To top it off there was a nice cloud cover in the area which got me excited for some photo opportunities. The trail starts off easy, headed downhill at a slight angle. It runs into another trail, going left or right. 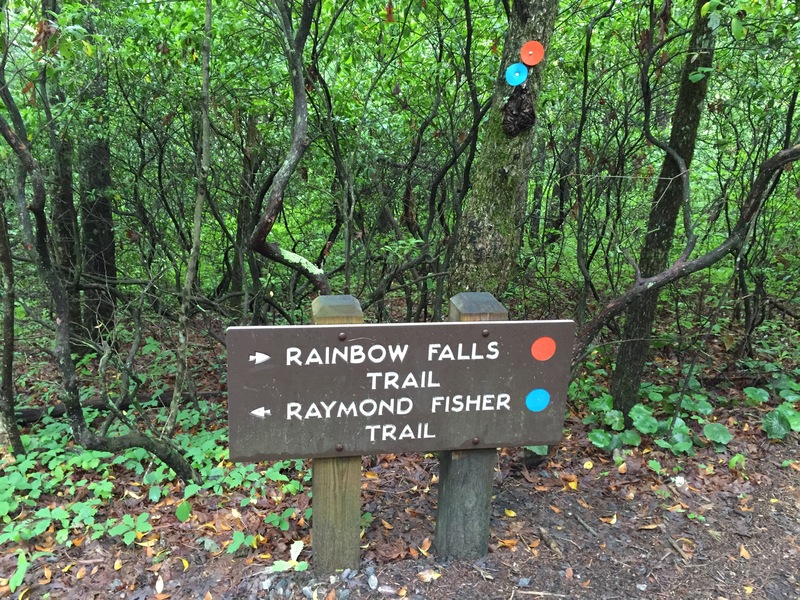 The Rainbow Falls Trail heads right here. Since the last time I have been here, they have added some bright yellow “caution” signs that I personally find distracting. They are necessary I suppose. 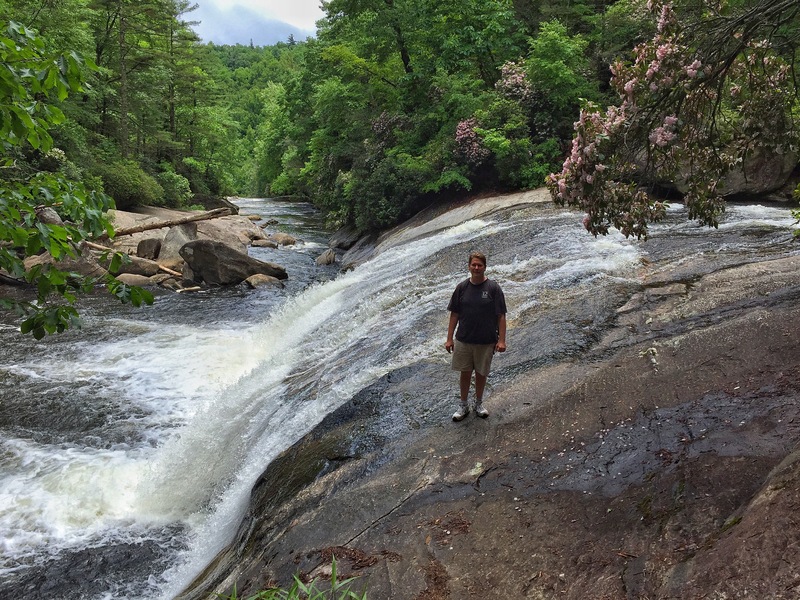 Heading down the Rainbow Falls Trail, it soon leaves Gorges State Park and becomes the Pisgah National Forest. Coming down the trail, a waterfall can be heard far below. This sound is coming from Stairway Falls. I used to think this was Rainbow Falls, but looking at the map, the trailhead is much closer to Stairway Falls, and there will be a point where you are parallel to it, just way up the mountain. Just before the trail joins up with the river, on the way down still, is a side path that is marked by a brown carsonite sign. 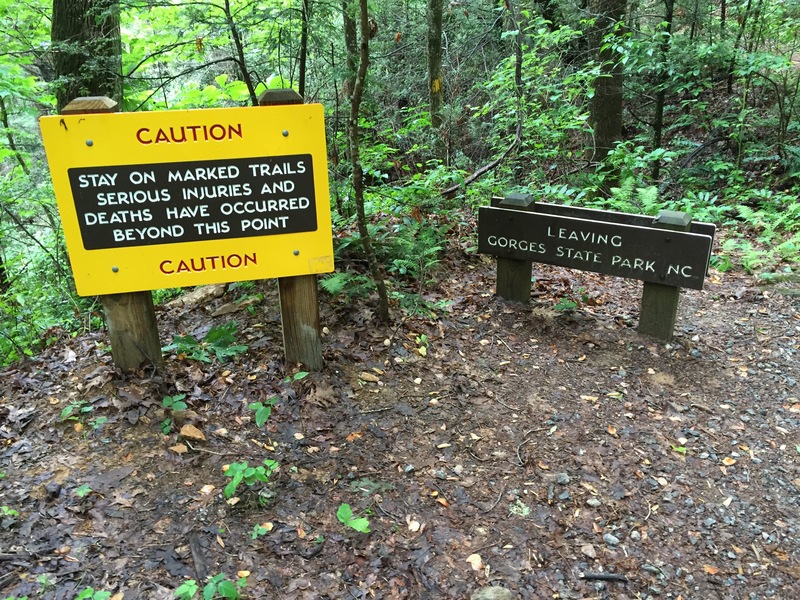 It does not say it, but the side trail to Stairway Falls heads left here. It immediately narrows and is eroded in a few spots. There was a spot where my brother just about became a part of the waterfall below as his feet were too big for the narrow trail. Either that, or he just wasn’t paying attention to where he was going….rookies…lol! This narrow trail meets the Horsepasture near a campsite and Jerry got his first good river view. I had to keep reminding him that we were not in a gym and to quit posing. These narrow trails, rocks and roots to navigate, and hills to manage might resemble some type of competition training he was used to. However, I reminded him we were out here to get his mind away from all of that, if only for a short while. It will all be there when you get back I told him. Our father suggested I just push him in to cool him off. Since he bench presses about 3 times my weight, I ditched that idea. Stairway Falls was just downstream, as the trail comes out at the top of 5 consecutive 10 foot drops, one after another. The trail gets a little steep here as it makes its way to the base. The view is not great going down the path, but just wait. It will be. Once down to the base, there are plenty of large boulders to sit for awhile and enjoy the beautiful scene. I could hang out down here all day. This is one of those places that must be seen in person to fully embrace it, and experience the waterfall’s true power. Pictures, while they never give a waterfall it’s true justice , really come up short on this one. 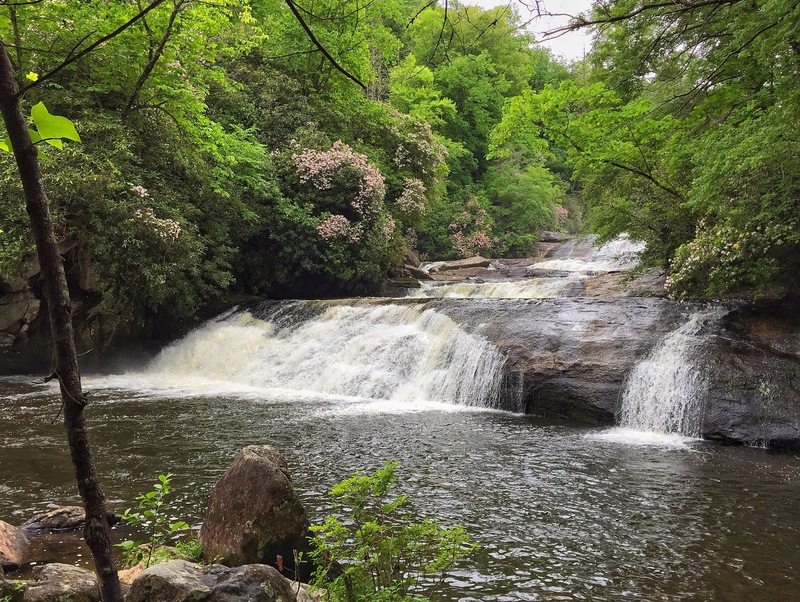 This is a combined 50 foot waterfall, and the Laurel were in full bloom! Jerry liked Stairway Falls. I could tell from past trips here that the water was up slightly. I wanted to see his reaction as he made that final ascent, and over the hill to the mighty Rainbow Falls. It should be flowing nicely today. We had some hiking to do first. 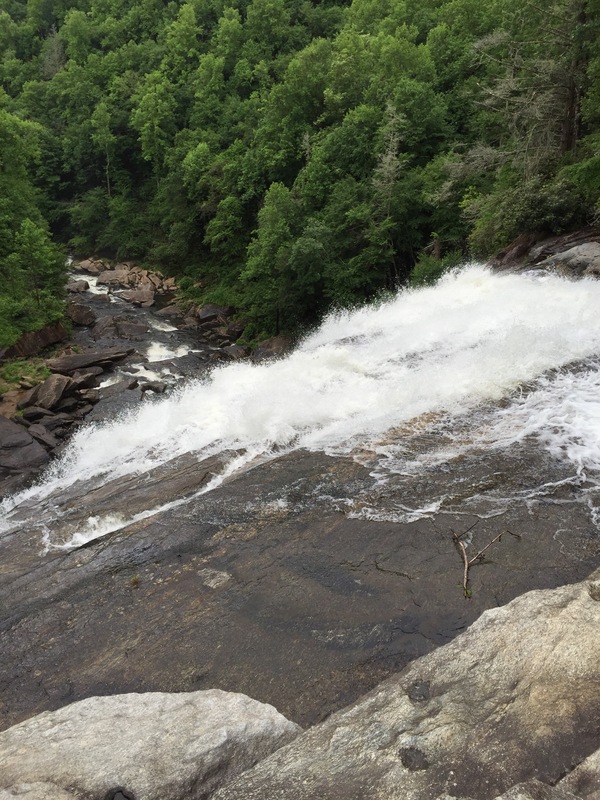 There is some distance in between these 2 falls, as the other 3 are all kind of grouped together upstream a ways near the highway NC 281. It is good hiking though. 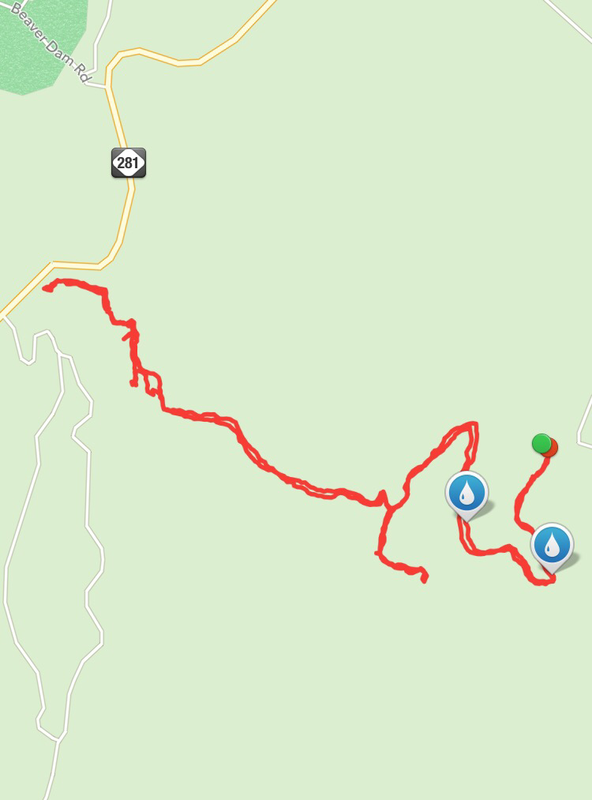 The Rainbow Falls Trail is in very good shape. The trail goes up and down some along the river. There are a few creeks to cross. One is of decent size, but rocks have been placed to make the crossing easy. The trail begins to do some climbing with the aid of some well placed wooden steps. They weren’t always there. I have now been doing this long enough to remember the Horsepasture in a slightly wilder, more remote state than it is now. 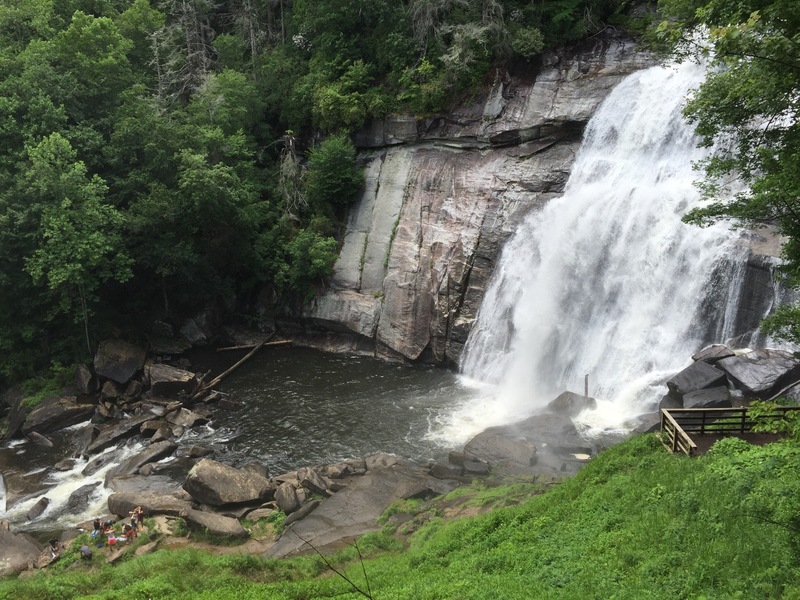 After the climbing is complete , one of North Carolina’s largest, and most scenic waterfalls comes into clear view. Rainbow Falls, at 150 feet is amazingly large, and loud. The trail comes out way above the river, and you will be across the gorge at a spot that I would say is 3/4 the way up the waterfall. The very heavy mist created from this waterfall heads straight up the gorge, crosses the trail and greets hikers with a refreshing, cooling spray. Sometimes this is welcome, sometimes not, depending on the weather. It is also the reason for the name of this waterfall. If you are here on a sunny morning roughly 9-11 a.m., the sun angle and heavy mist create a beautiful large rainbow across the middle of the waterfall, visible from the trail. As the morning progresses, the sun angle moves the rainbow down and towards the right, until it disappears completely. We did not witness this on this trip, as there was a heavy, low cloud cover. The waterfall was still gorgeous. 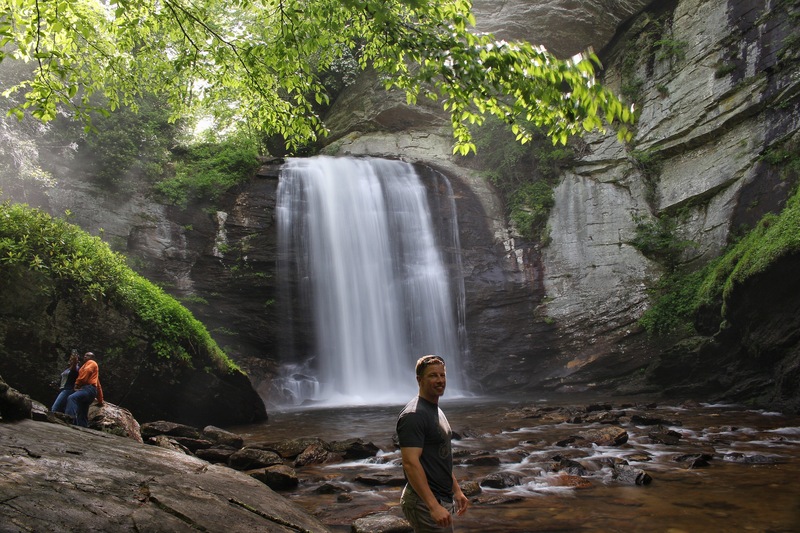 From the moment Rainbow Falls comes into view, the next 1/4 to 1/2 miles of trail are unforgettable. The overall scenery and multiple views of 3 back-2-back-2-back waterfalls leaves images in the mind that will not fade anytime soon. From the view at the top, a side trail breaks down towards the base. It passes by a recently constructed viewing deck on its way down. Most days, I would continue on down to the base. The views from the rocks below are outstanding. However, the rocks and trail were all wet below, from the nights rain still. Trying to show little brother some common sense, we avoided the wet rocks. There was still more to see up the trail. 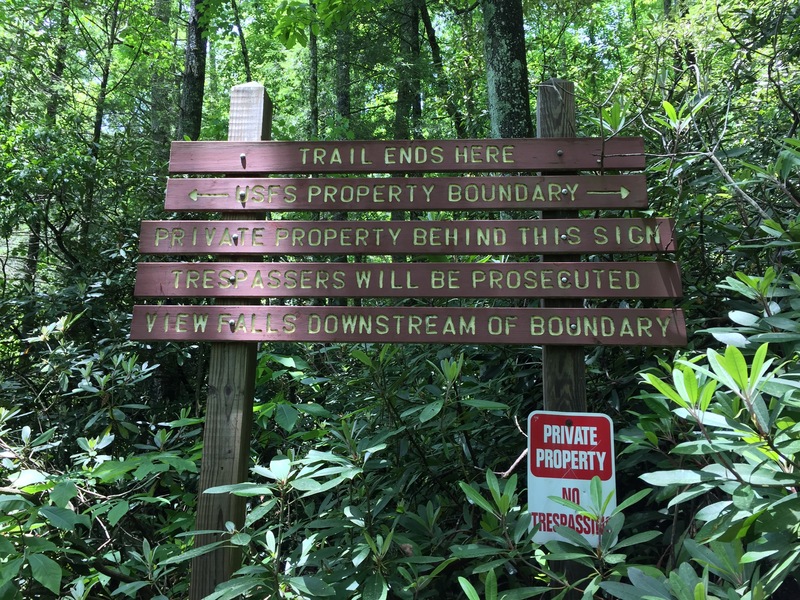 After working our way back up a side trail, we reconnected with the Rainbow Falls Trail and worked our way to the top. As the trail passes a very nice, remote camp site near the top, some side trails lead out onto the rocks for some magnificent views from the top. I am normally not a “top of the waterfall” guy, but this one is different. As long as the rocks are dry, it is fairly safe to walk out up here. Just don’t get too close, people have fallen off here, and died. 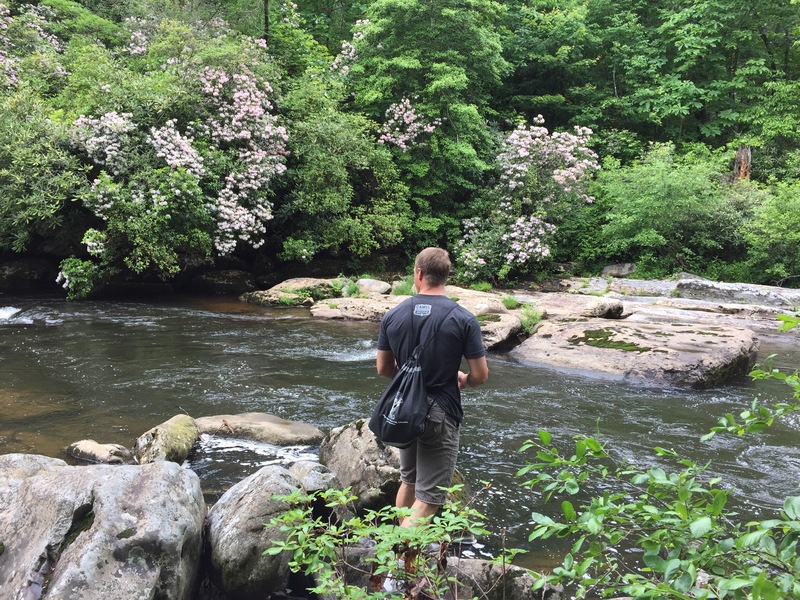 Once the the top views have been taken in, turn your head upstream. Just at the end, before the river makes a 90 degree turn, is Turtleback Falls. This is perhaps the finest 10 foot waterfall anywhere. The strip of River between the falls is all bedrock. The high volume river moves very swift through here. To quote Waterfall Rich: ” Do not get int the water here for any reason”. A 150 foot fall to certain death would surely result. This is a gorgeous area, but it must be respected. 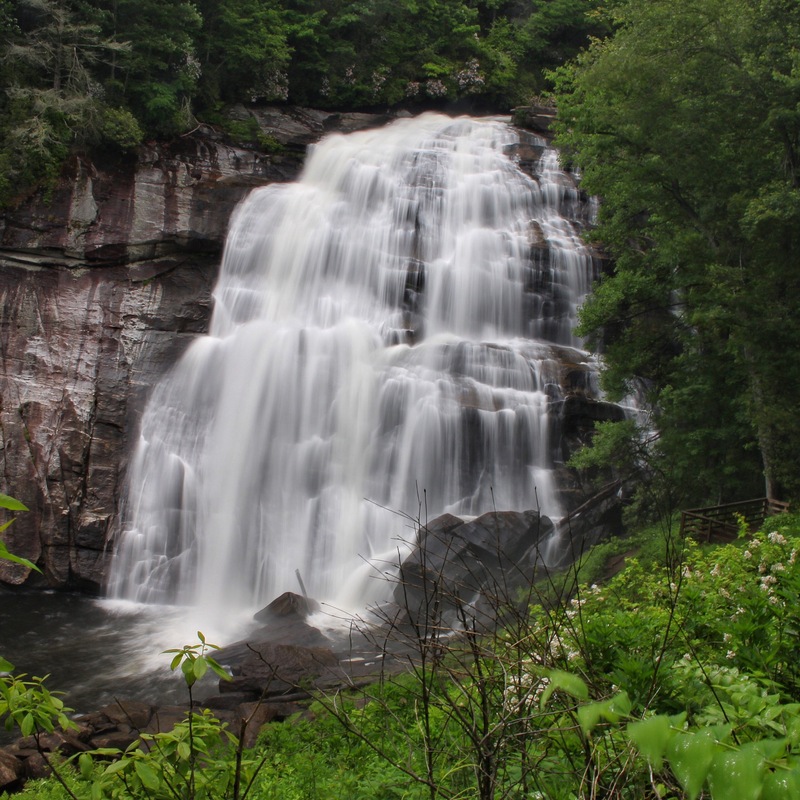 Now, up the short walk to Turtleback Falls, several awesome viewing areas await. There is a large rock directly across the river from Turtleback Falls, as the river makes its 90 degree turn here. The view of the raging river coming down the bedrock river bed here is amazing. People in the summer slide down this waterfall frequently. I have yet to do it. Maybe this summer! The water was too high today. While it is fairly safe in normal flow, if you don’t get out of the pool, you might drift down into the swift current as it heads towards Rainbow Falls. I have read where this has happened, so common sense must persist over all other thrill seeking impulses that one may have. One person also commented on my Facebook page www.facebook.com/waterfallshiker, that he almost drowned here as the waterfall kept trying to pull him back under. Just food for though before trying this. With all of that said, I have seen people enjoying sliding down Turtleback Falls numerous times. As we made our way up towards the next waterfall, we stopped for a few photos from the side of Turtleback Falls. It’s a particularly scenic spot. Nasty!! Don’t worry. Just turn left here, and follow the trail beside the fence down to the river. It brings you out at a spot where the waterfall is only in partial view. We had to work our way through some tall grass and rock hop into the middle of the river to see an unobstructed view of this gorgeous waterfall. We sat for a few minutes, took some photos and that was it. Jerry noticed several nice size fish in the pool next to us. Where was fishing gear when we needed it? There is Jerry again…still posing. 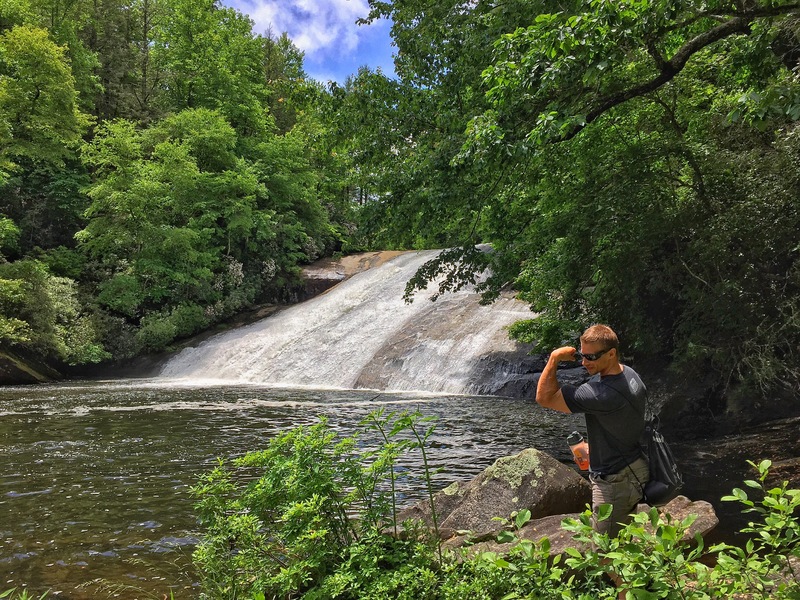 I told him that it was good that he still had this much energy because once we arrived at the bottom of Rainbow Falls, the last half of the hike was a steady climb up. That is the part that always wears me out. He did good though and towards the end, while I had to stop a time or two for a quick breather, he was still pushing on hard….damn athletic kids!! He began to kid a little, mentioned he was going to leave me in the woods. I told him fine! I had the keys. He may be younger, stronger, but definitely not smarter…lol. All joking aside, we had a great day together. I really enjoyed spending some one on one time with him and seeing what a good, and goal “driven” person he has become as an adult. I definitely missed a few things along the way over the years with him. I asked if he wanted to see more, as there are tons of cool waterfalls within minutes of Gorges State Park. He declined, reminded me that he is a body builder and has to eat like 6 meals a day. 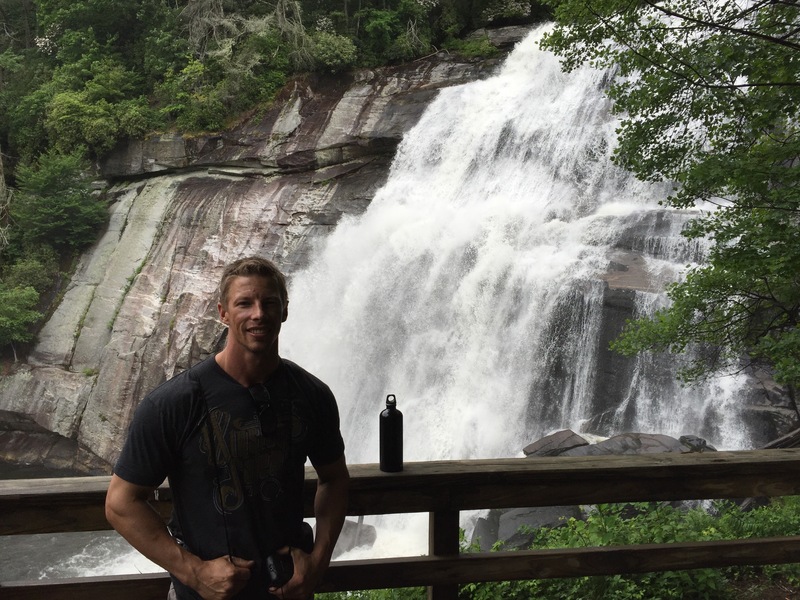 So off to Brevard we went to find one of my favorite Waterfall Hiking Roadtrip places for a great Burger.. The Square Root Restaurant. It was delicious and was very welcome after the 5.3 miles we hiked. Here is a map, showing roughly the path we took. 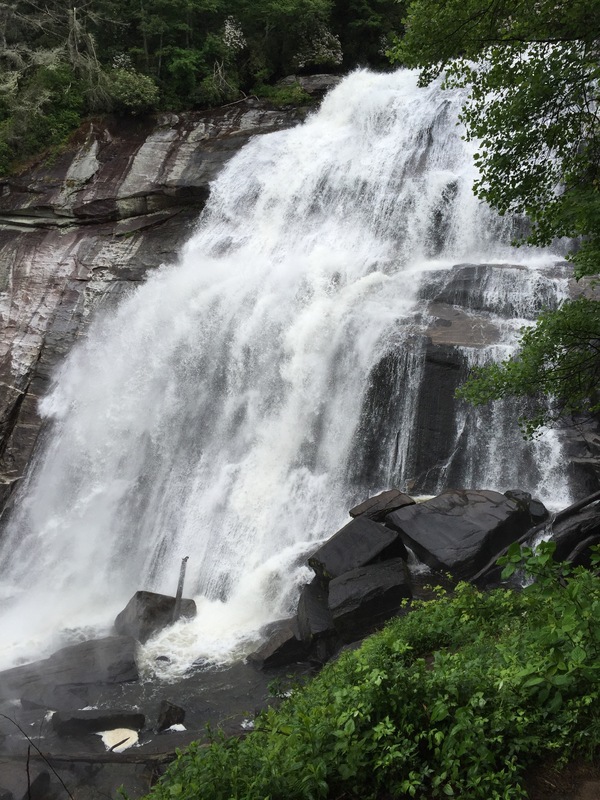 Here are a few short video clips of some of the waterfalls we visited! Is that awesome Mexican restaurant in brevard still there?? I’m not sure which one you are talking about Jeff. I usually stop in Brevard for the Burger at The Square Root or at 12 Bones in Asheville for Ribs, when traveling, or the dreadful fast food places if I am in a hurry. Let me know what the Mexican Restaurant is, and I will check it out my next time out there. Thanks. Rainbow is magnificent! Have made this same hike twice and it is awesome! Glad you had some time with your brother….. Thank You Steve! It is just an awesome hike. I’ve seen it just about every way except iced over. The brother time was special. I often hike with my sisters and its always Great fun! 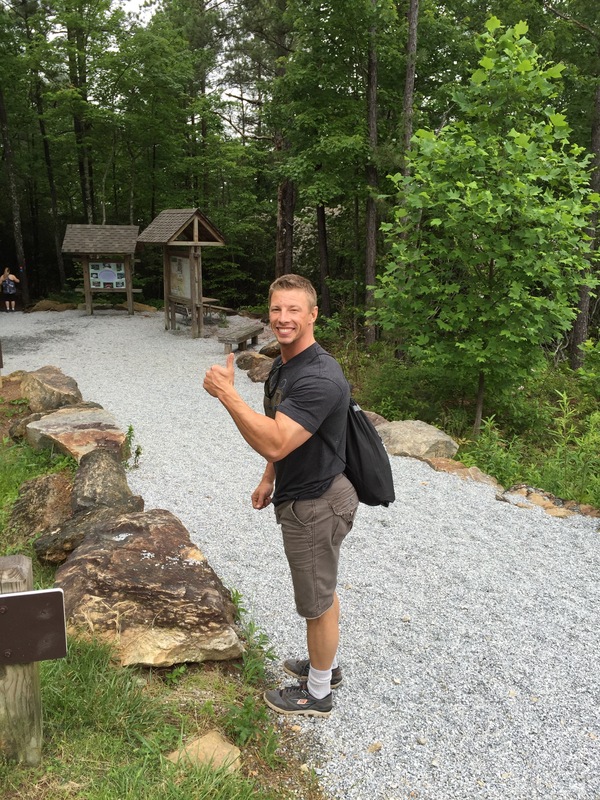 I would love to do this hike…. I am planning to go to the Gorges State Park for the first time. Your article is useful. I did call the park visitor center several times. However, individual websites make things clearer. I am travelling from the North of Atlanta. It will take me 2 1/2 hours to get there. I plan a big loop to stop at the Whitewater Falls first then this park. 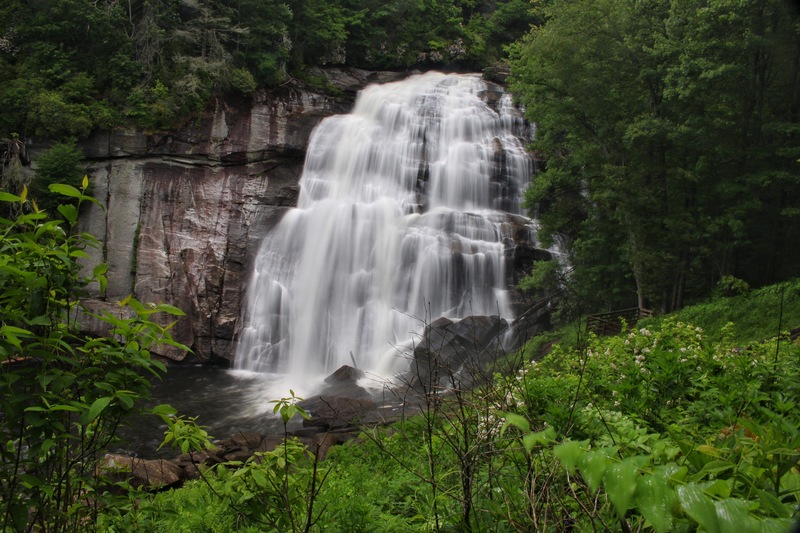 The dream loop is when I am done hiking to Rainbow Falls, Hidden Falls, Stairway Falls, Turtleback Falls and Drift Falls, I will go next to Glen Falls, the Bridal Veil Falls, Bust Your Butts Falls and end at the Callasaja Falls in Highlands. I know it’s a bit too much of the information. Since your name is Waterfallhiker, I can get good information from you. I am not saying that I could do all this in one day. 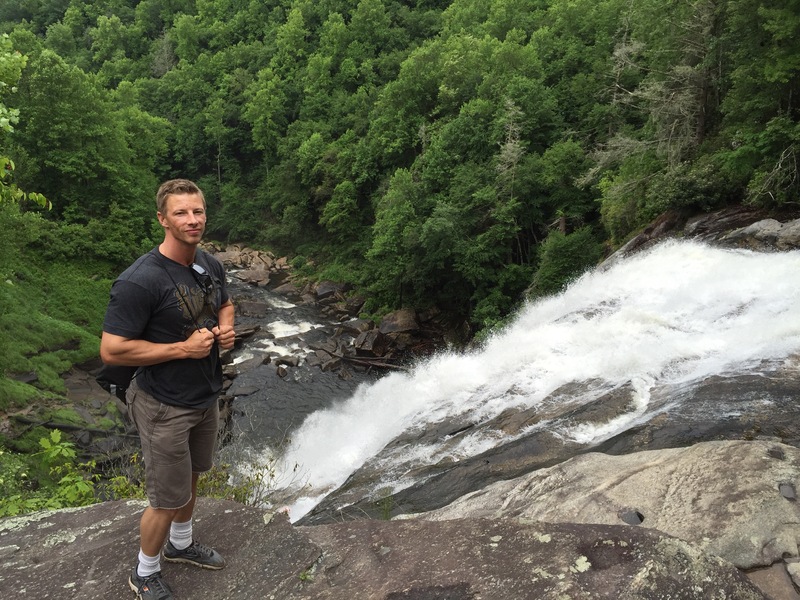 Hiking at the Gorges State Park will probably take the whole day with hiking and enjoying the beautiful waterfalls. Do I have a specific question? ahh How long did you spend to do the whole thing out and back?